Plan4Health was a multi-year program that funded projects at the intersection of planning and public health in communities across the nation. APA and the American Public Health Association partnered with the Centers for Disease Control and Prevention (CDC) to evaluate the overall impact of the project. By capturing data at the local and national levels — as well as tracking the implementation of the program itself — we were able to assess whether the project moved toward our vision: the full integration of planning and public health where we live, learn, work, and play. Learning about what worked and what didn’t is not only essential for strengthening future initiatves at APA, but also contributes to the healthy planning movement. Plan4Health is part of a broader effort to understand how the built environment shapes health and how planners can contribute to creating healthy places. The CDC's Guide to Community Preventive Services (The Community Guide) is a collection of evidence-based findings of the Community Preventive Services Task Force (CPSTF). Check out the recently released review of Built Environment Approaches Combining Transportation System Interventions with Land Use and Environmental Design to learn more about best practices for increaing phyiscal activity in your community. The real-world examples grid organizes the guide's recommendations by cost, complexity, and scale. Policy: Written statement of organizational position, decision or course of action (such as ordinances, resolutions, mandates, guidelines, or rules). Systems: Changes in organizational procedures (such as personnel, resource allocation, programs). Environment: Physical, observable changes in the built, economic, and/or social environment. PSE changes, however, are long-term strategies for making the healthy choice easier. As any planner knows, plans offer a framework for implementation, but tangible results are often years away. The same is true with PSE improvements. Given the short timeline of Plan4Health, coalitions that passed policies or instituted procedural changes did not see the impact of their efforts within the 13-month project period. The success story from Bensenville, Illinois, for example, highlights the work of the coalition to engage community members, raising awareness about the importance of approving an active transportation plan. And, while the community did pass a Complete Streets policy, the lives of village residents were not immediately impacted by that change. To capture the impact of PSEs, Plan4Health staff members tracked “reach.” A measure developed by the CDC, reach offers a simple way to estimate the number of people potentially impacted by a PSE improvement. Coalitions define a setting where a PSE improvement takes place and then calculate the number of people with access to that setting. In Bensenville, the setting is the Village of Bensenville. The active transportation plan will guide plan-making across the village — and we know there are just over 18,000 people living in Bensenville. Therefore, we calculate the reach of the B-Well Bensenville coalition as 18,000. Reach also allows us to aggregate across diverse projects. 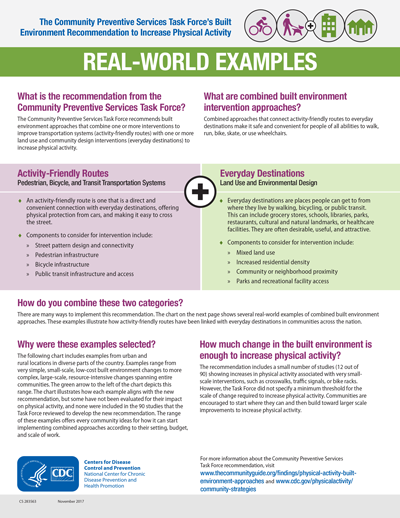 How do you compare an active transportation plan with a healthy corner store program? By focusing on the community members that will benefit from the interventions, we are able to estimate the potential impact of the entire Plan4Health portfolio: 3,800,000 people. Like any quantitative data point, reach is strengthened by understanding the context. Each coalition also shared qualitative data: Plan4Health success stories. The opportunity to hear from community members — in videos, blog posts, or webinars — elevates lessons learned and transferable skills, bringing the work to life. Plan4Health also contracted with The Policy & Research Group (PRG) to conduct a process evaluation of project activities. Plan4Health and PRG staff collaborated to develop an evaluation plan which specified goals, objectives, and indicators — along with the data sources used to assess progress. As a process evaluation, the goal was to understand how the work was implemented and how the activities were moving toward the long-term goals to decrease rates of chronic disease and increase health equity. Evaluation Question 1: To what extent does the Plan4Health project increase collaboration between national and community partners? Evaluation Question 2: To what extent does the Plan4Health project increase messaging on the importance of policy, systems, and environmental improvements? Evaluation Question 3: To what extent does the Plan4Health project increase community capacity to implement policy, systems, and environmental (PSE) improvements (through coalition building, community needs assessment data, community action plan)? In addition to the review of monthly reporting forms and tracking spreadsheets, PRG surveyed coalition stakeholders to assess perceptions of coalitions’ collaborative efforts and perceptions of the effectiveness, quality, and impact of the Plan4Health project. 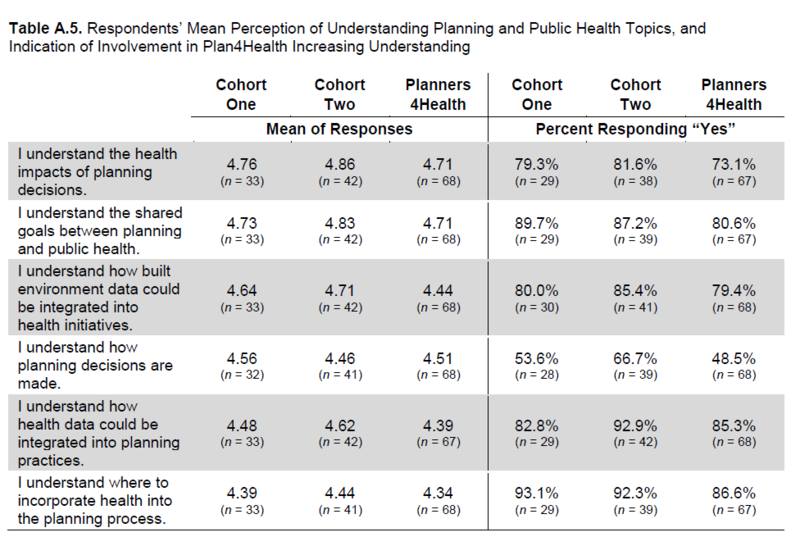 Multiyear survey results from the community survey: "Respondents’ Mean Perception of Understanding Planning and Public Health Topics, and Indication of Involvement in Plan4Health Increasing Understanding." Image courtesy The Policy & Research Group. In order to provide a more nuanced understanding of the work, PRG also interviewed capacity-building awardees. Five coalitions in Cohort Two were granted funds either to launch a cross-sector coalition or to implement PSE improvements with an established coalition. The opportunity to understand how communities initiated this work will make it easier for others to take that first step toward healthy design. At the end of each year, PRG produced a report to provide feedback to Plan4Health staff on whether the project was implemented as planned. The Plan4Health evaluation contributed to continuous program improvement and the broader knowledge base about how this type of collaborative, multi-tier project can improve collaboration between national and community partners, messaging on the importance of PSE improvements, and the capacity of planning and public health leaders to work with community members to advance health-promoting built environments. To review PRG annual reports, capacity building memos, and Planners4Health evaluation, visit the evaluation page on the Plan4Health website. Plan4Health was part of a larger coalition: Partnering4Health. Aggregating experiences across two additional projects, the American Heart Association’s ANCHOR and the National WIC Association’s Community Partnerships for Healthy Mothers and Children, the Partnering4Health coalition produced a white paper outlining lessons learned and highlighting transferable experiences. The goal of Partnering4Health program is to improve the health and well-being of communities. This interactive self-paced eLearning course describes why sustainability is an integral part of the Partnering4Health program. Describe the healthy communities’ movement and current funded collaborative efforts. Define sustainability and what sustainability means across Partnering4Health national organizations. Review the key elements for sustaining the healthy communities’ movement. Review key assets and resources unique to each funded Partnering4Health national organization for sustaining PSE strategies. And, of course, we are only just starting to see how Plan4Health has shaped communities — and impacted APA. While the funded project period has concluded, planners and public health professionals continue to engage with each other through APA’s Healthy Communities Collaborative (HCC). Stay connected with the HCC and join the new Facebook group! Top image: Word cloud featuring health topics. Image courtesy APA.